When you’re getting ready to move, whether it’s an inner state move or it’s to an entirely new state, being as organized as possible and preparation is crucial. One of the major components that can make your move all the easier is a moving company. However, you need to make sure that you select the right moving company for your needs in order for it to be beneficial. After filtering through various moving companies online, it can be overwhelming to determine which of the companies is going to be the best fit for you. Today we’re going to touch on a few tips that can help ensure you’re selecting the right company for your move. Let’s dive in! Each moving company that you come across is going to have something unique to offer you, that’s why they’re in business! Learning about the moving company that you’re looking into is a great way to get an idea of the services that you’re about to receive. By looking into the company, you can get a feel for what their mission is and what you can expect when you choose to work with them. Not every move is the same and not every move is going to require the same services. Someone moving from a one bedroom apartment across town is not going to need the same services as someone moving from a five-bedroom house across the state. For that reason, understanding your needs before you begin to search for moving companies is a must. Once you’ve determined what your needs are and which services you’re interested in taking advantage of, you can start to narrow down the options that you have. Quality matters, especially when you’re looking to hire a company that’s going to pack and move your personal belongings. For that reason, it’s always important that you look into whether or not a company has their licensing and if they’re insured before you choose to work with them. If a company has chosen to invest their time and money into this step, you know that they’re going to take your move seriously. Aside from that, you know that they are qualified movers. Both of these points are extremely important as you decide which moving company you’d like to work for. A feature that the internet now offers us is the ability to go and read through reviews to get an idea of what prior customer experiences looked like. Seeing what other individuals have experienced while working with that company can help you get an idea of what selecting this company would look like. Aside from that, it could also be the warning signals that you need to stay away from a company. Look into what previous customers are saying and get an idea of whether or not their experience is something that you’re wanting to have. Moving heavy pieces of furniture or even large amounts of boxes is quite a task to take on. Doing it on your own can require multiple days, or weeks, to get the job done, but that shouldn’t be the case for your moving company. The moving company that you choose to work with should have access to plenty of high-quality equipment that contributes to the ease of your move. When you speak to a team member of the moving company, or you inquire more information from a moving company, ask them about the equipment that is included in their services and what they’ll be using throughout. This will give you a good idea of how long it will take to complete the move while also gaining some insight on the company itself and what to expect when you work with them. When people look for movers to hire they are usually drawn to the chain companies. They have a well-known name associated with their business and that is often enough to sell someone on the services. Unfortunately, the quality of service may not be the same. Local movers have invested themselves in the community. They are dedicated to providing individuals with the services that they need to enjoy their move. While it may be tempting to select a chain moving company for your move, always look into the local movers in your town to see what types of services they can offer you. Looking for movers is much different than looking for movers that can take care of your needs. Even with everything that we’ve talked about above, it’s important that you recognize that your needs and the needs of your move are going to be entirely unique and need to be the primary focus as you go about searching for your ideal moving company. Don’t look for the moving company with the lowest price or the movers with the most reviews, or at least don’t let the search stop there. Take all of the points that we’ve mentioned above into consideration with your move as the focal point, and it should help make the right choice all the more evident. Moving isn’t an easy task to take on. It requires planning, money, organization and hard work — but we want to help. Skyline Moving Company has been able to provide Colorado with the moving services that they need. Our goal has always been to lift the burden from your shoulders so that you can enjoy this new chapter of your life. If you have a move that’s coming up, it’s time to call Skyline Moving Company. 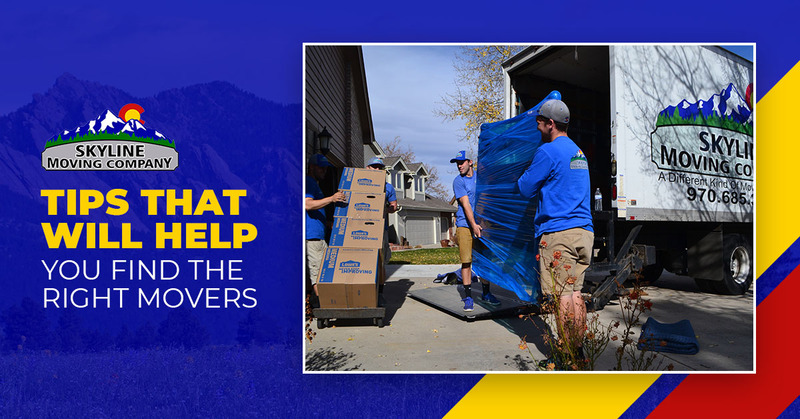 We are a full-service moving company that can help you with moves from one Colorado city to the next or from one side of the state to the other. From the packing to the unloading we’ll be there to ensure your move goes seamlessly. Contact us today to get an estimate on your move and to get additional information on how we can help you.